What can you learn about leadership from a 13-year NBA veteran and World Champion coach? Turns out, a lot. Before we said goodbye to 2017, we said hello to former Boston Celtics and LA Clippers coach Kevin Eastman at our last Quarterly Luncheon of the year. Like our membership, Kevin has a thirst for knowledge – becoming very agitated if he can’t find an entry for his WILT (What I Learned Today) notebook each day. If you were lucky enough to be at the luncheon, you heard stories about winning championships, managing personalities and, most importantly, what it takes to lead teams to greatness. Simply put, Kevin Eastman’s life is truly a lesson in leadership. Here are just a few other nuggets he shared with us during his presentation. Create buy-in. Be competent. Be trustworthy. Work hard. Be sincere. Do you have a thirst for knowledge that will help you grow your business? Or maybe you need inspiration to help you get “unstuck”? VACEOs can help you work ON your business – not just in it. Our members are regularly exposed to inspiring presentations by local and national thought leaders. Topics range from management techniques to trends in technology and marketing, and much more. Become a member today, or contact us about attending an event as a guest. 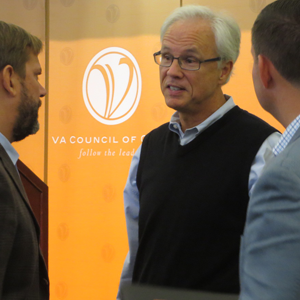 *Source: ““Leading in Today’s Competitive Environment,” VACEOs Quarterly Luncheon presentation by Kevin Eastman, former NBA coach and World Champion turned motivational speaker. 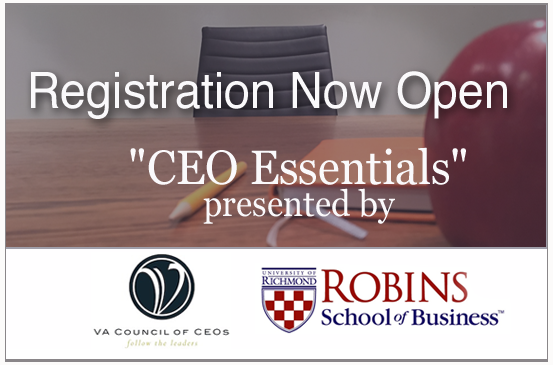 Small business CEOs raved about our first CEO Essentials program, and we are pleased to announce that the Robins School of Business will again offer an educational program designed specifically around the topics that mean the most to you. This winter’s “CEO Essentials” program includes classes on strategic planning, marketing, talent development, conflict management and much more. Sign up for full, half or individual sessions. Register now! Classes begin February 6. About the 2018 sessions: All CEO Essentials sessions incorporate action learning and hands-on experience with content. Class size limited to 24 participants. Registration is limited to CEO and top-level leader(s) only; limit 3 individuals per company per year. Each full-program registration reserves a “seat”; organizations may choose whom to send to each session; limit 3 unique individuals. Reserve your “CEO Essentials” seat for you and your executive team today. 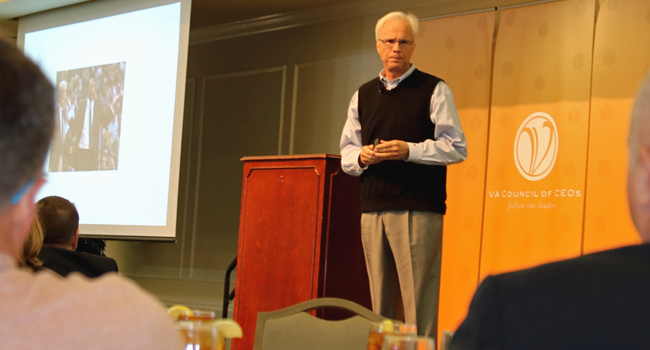 Each quarter the Virginia Council of CEOs (VACEOs) and University of Richmond’s Robins School of Business partner to take the pulse of top executives in the region through a comprehensive Economic Outlook Survey. 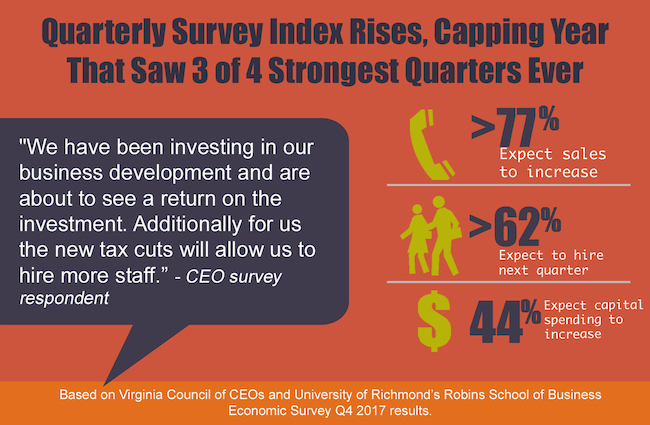 The fourth quarter 2017 CEO Economic Outlook survey finds that optimism among Virginia CEOs grew from the third quarter, notching increases in all categories. The survey’s index, which measures executives’ views on projected hiring, capital spending and sales over the next six months, was the third-highest ever. 2017 was an optimistic year for CEOs, as the survey achieved three of its four highest marks ever, including an all-time high in Q1. The survey has been administered quarterly since 2010. “Small business CEOs are enjoying the best business environment since the Great Recession. Those that have become adept at dealing with rapid change are thriving,” says Scot McRoberts, executive director of the Virginia Council of CEOs. Of note: Nearly one third (20) of the 61 respondents mentioned the overall economy and tax cuts as reasons for their optimism. Sixty-one CEOs responded to the survey, which was administered December 17, 2017 – January 3.